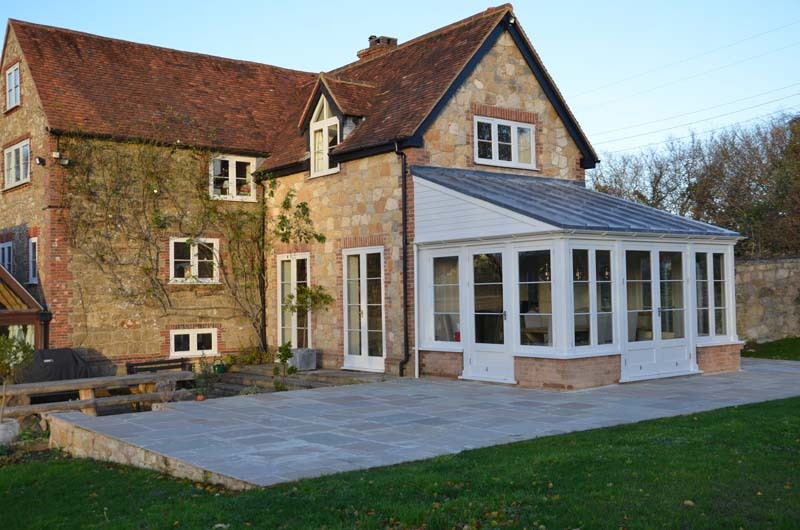 Beautifully crafted in hardwood with a lead roof, this Edwardian style extension features a solid timber tonque and groove interior, and is part of a complete renovation of this grade 11 listed farmhouse including a stunning kitchen. The kitchen features granite and solid oak surfaces with a durable oil finish, hand painted hardwood doors, and polished oak interiors. 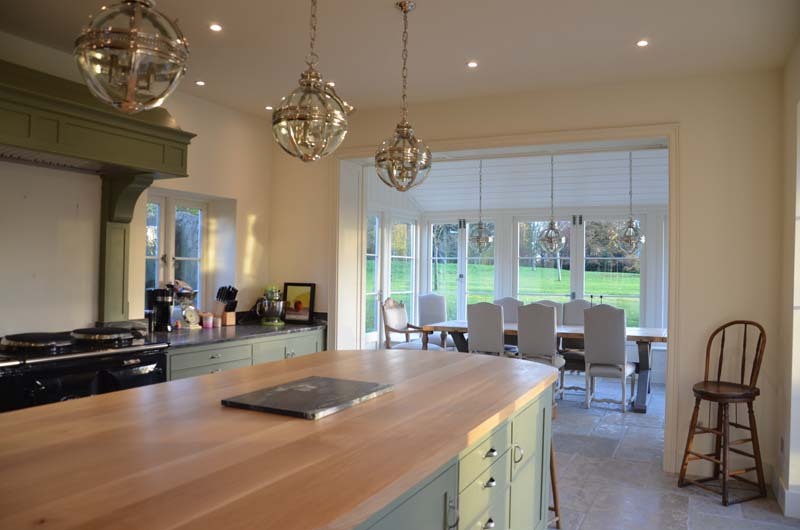 This bespoke kitchen was installed in what had been the garage (remember when cars wouldn’t work unless they were cossetted overnight?). 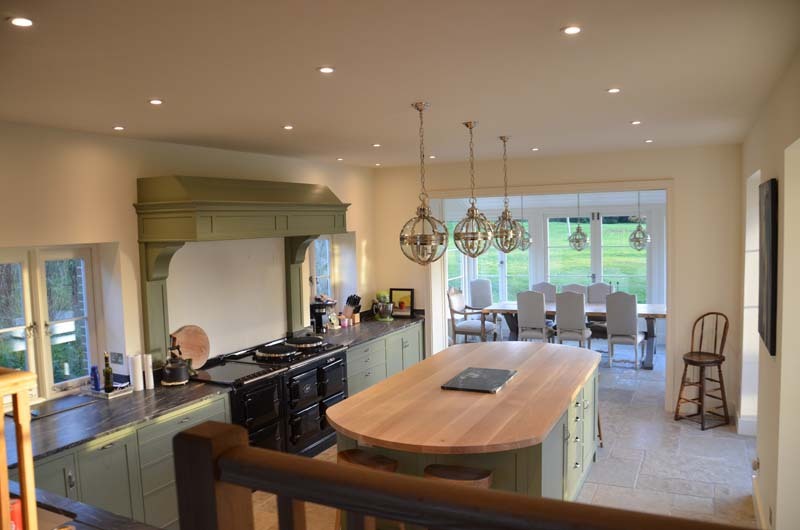 Built to our usual high standards using premium fittings and high quality hardwoods, this kitchen features a whopping larder cabinet, ventilated to the outside for coolness, and a huge island ith drawers on one side and seating for a growing family on the other. Needless to say our clients are delighted! What a challenge! 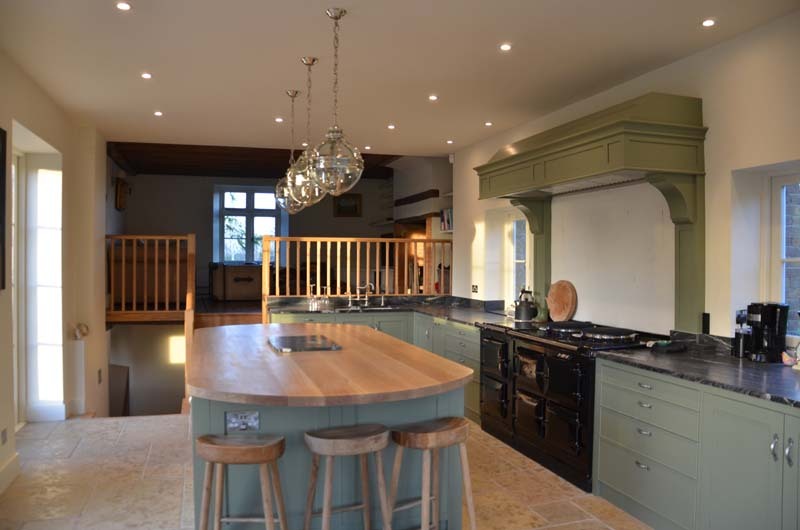 The kitchen in this wonderful grade 11 listed watermill was octagonal, the walls leant away at an angle and there were a couple of huge pillars in the centre. Undaunted we came up with what we modestly think is a fantastic layout, exploiting the unusual shape and angles. The finishes, fittings and design reflected the buildings industrial past, with raw oak, copper and traditional marble surfaces, a commercial rangecooker, and handpainted hardwood cabinets.